1/2 teaspoon fine cardamon and cinnamon. Place milk in a pot and bring to a light simmer. Add the cardamon and cinnamon. Add the bran oats and cook till thickened. You can add more milk. Once thick, not too thick. 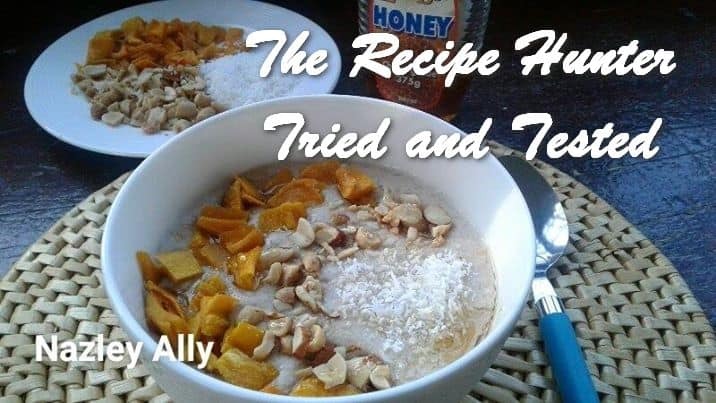 Add the coconut, nuts and mango chunks. Place off the stove and cover with the lid. After an hour you can eat it. To allow the mango chunks to flavour it. Then one can place it in the fridge to draw flavour and eat it the next morning with honey.